I weighed myself yesterday morning and I’m 153.1, which is actually a lot less weight gain than I expected from my last weigh-in in June, which means I’ve gained about 4 pounds in the last 3 months. Not all that bad, really, but it still means I need to lose at least 25 pounds. Last week while grocery shopping I bought some ground chicken to make soboro, something that I rarely make because cooking the ground meat usually takes a lot of standing in front of the stove to get the meat nice and broken up. Today I finally made the effort to cook it and used the recipe from Yum-Yum Bento Box , except 4x in size. This is a very classic bento and I don’t recommend you ever pack it into something without a very secure lid. The meat is very crumbly and therefore can shift around a good deal along with the beans. To pack this, you simply add a thin layer of rice on the entire bottom of the box and then add the meat, eggs, and beans neatly next to each other. The eggs are sweet and so is the meat, though the soy sauce in the meat is salty enough to balance the sweetness of the eggs. I used boiled sugar snap peas for the green portion, but you can use any green veggie really. When using sugar snap peas, you should boil them for less than a minute. Let the water come to a rolling boil and then toss the peas. After a little bit, drain them immediately and run under cool water. 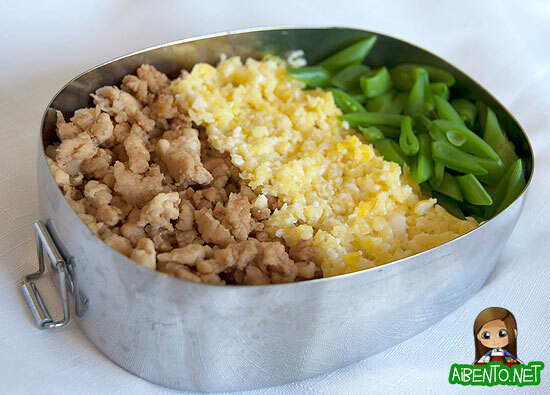 Slice thinly on a diagonal and then place it in the bento.